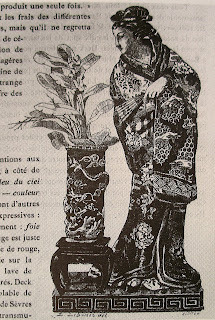 if you google-image emile reiber, you will find only, or almost only, items of domestic use and decor, clocks, vases, and the like covered, each of them, with gorgeous, elaborate, asianesque embellishments. preceding these, however, was leiber's Premier Volume (of which, as far as i could see, there was no Deuxieme) of his albums. 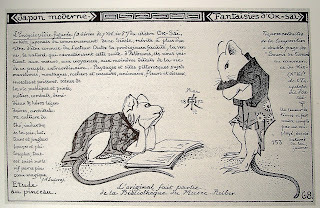 following, you will find a lame, google assisted, translation of a bit of Le Japonisme, the catalogue for l'Orsay's landmark exhibition of the same name in 1989. i hope the translation makes some sense, and will gladly provide the french to anyone who asks. 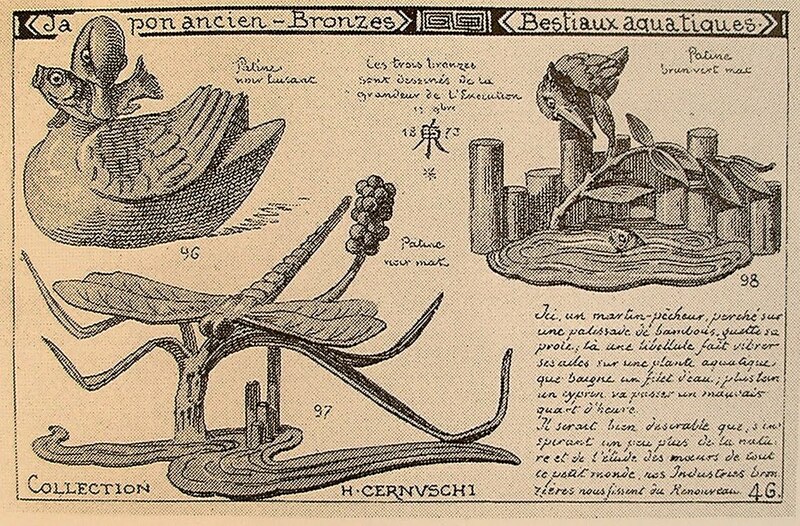 In this time of new explorations, style-books for artists began to appear. 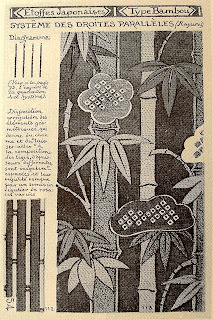 These presented samples of Japanese ornament for craftsmen to study, or simply copy, thus adding to their repertoires examples of the Japonesque: The books featured replicated objects, as in Albums-Reiber, or, more often, the designs of objects or books found in valuable collections. An attempt was made as well to feature each in its original context. The artists and designers who created the style-books had as a goal the reproduction of the arts of one spot of the world that they may travel off in any and all unexpected directions. 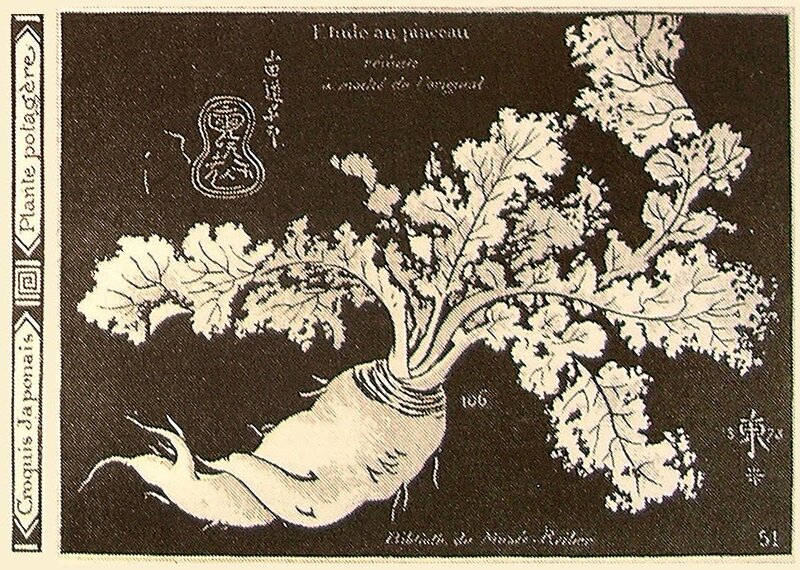 Japanese art, rapidly becoming more and more popular, began to become the subject of books. 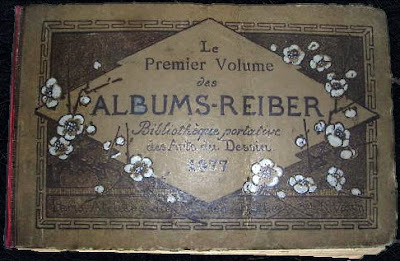 In 1877, the first volume of Albums-Reiber appeared. 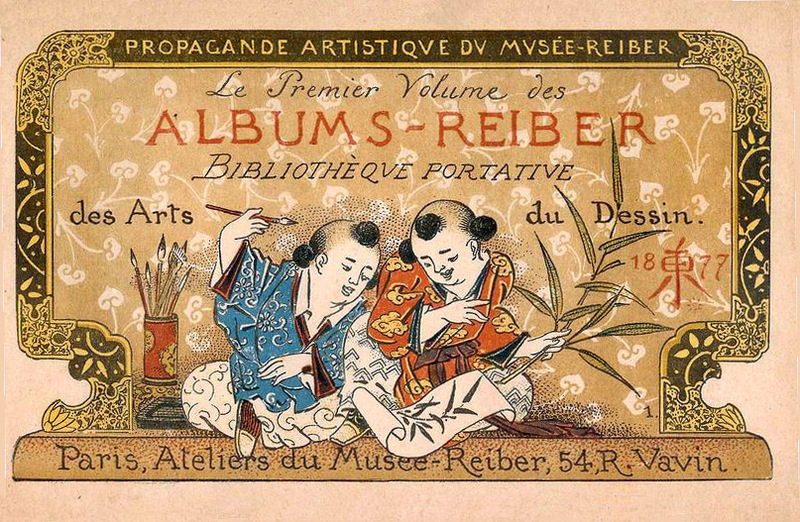 Emile Reiber, a Japonisant from the start, choose almost half of his images from the items of daily life in the Japanese culture, like tea, combs, or items in bronze. 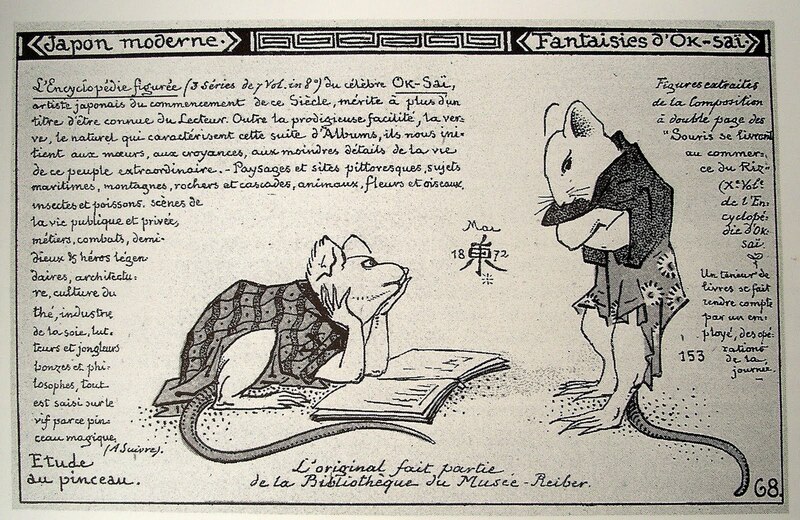 He also featured caricatures drawn from the Manga of Hokusai (see the little mice), which quickly found themselves being used to decorate plates in the factory Vieillard à Bordeaux. Wisely, Reiber gives these Hokusai manga the figurative title of Encyclopedia so as to ensure that they will be appreciated as valuable for as long as interest in Japonisme continued. It was also regularly reprinted in Japan. After 1880 M. Blanc du Vernet published a series of pieces on Japanese art, and in 1876 the painter Gustave Moreau did the same. 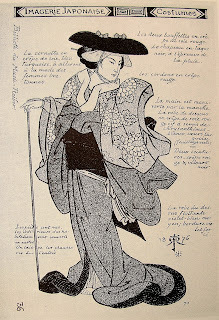 There are also, in Reiber, entries about Japanese costume; a note on one reads "the head-covering of silken crepe in turquoise blue, recalls the fashionable women of Brittany," thus adding important context. That context can be seen easily in the work of the artists of Pont-Aven, Gauguin or Sérusier, when they paint the Breton in the manner of the Japanese. In the 1880s, collections devoted solely to Japanese motifs multiplied; editions appeared from Thomas Cutler and George Audsley (A Grammar of Japanese Ornament), and Christopher Dresser (Japan, its Architecture, Arts and Art-Manufacture). 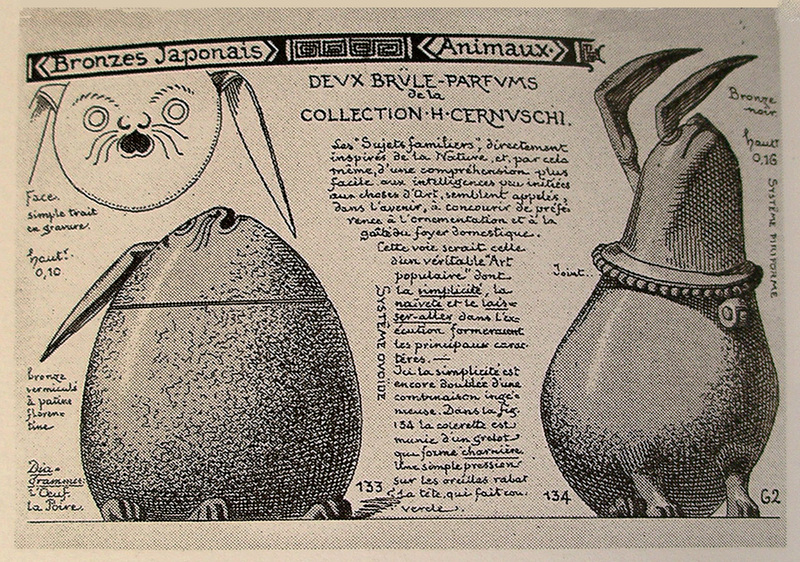 Among the other early books covering Japanese art history were Louis Gonse's L'Art Japonaise in France in 1883, and William Anderson's The Pictorial Arts of Japan in London in 1886. 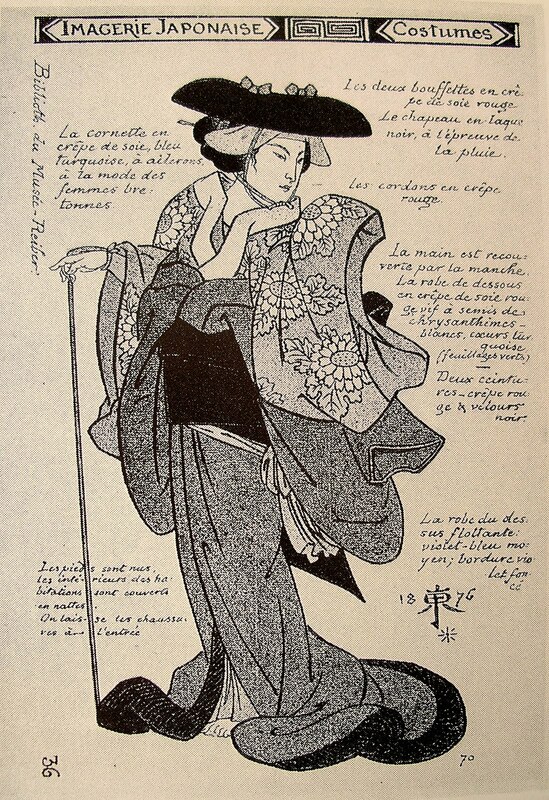 The apotheosis of this movement was the luxurious publication by S. Bing's "Artistic Japan," (1888-1891), a vast collection of images and short articles on Japan by the best specialists of the moment. The range of the nationalities of the contributors revealed the existence of a true international society of lovers Japanese art. to my eyes, generally depictions of anything japanese by one is not japanese is always marked by it's non-japaneseness. reiber's reenactments are so charming. the same, i should add could be said of any two artists of different cultures; you've seen the japanese portrayals of the westerners who barged in in the 1850s. i want to look at this more fully. 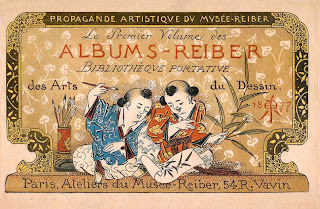 I would love to get my hands on any of those books; there is something about the combination of Japanese design with 19th century printing and book styles that I find irresistible. 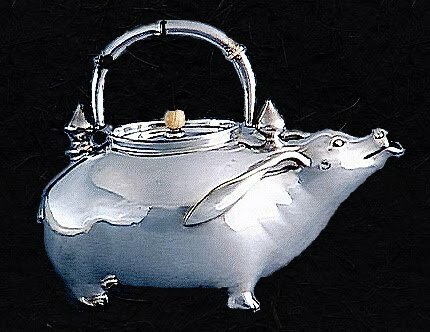 As for tea - I'm free next week. E-mail me at namastenancy at hotmail dot com and let me know what works for you and how we can link up. i have a very small collection of the moreaus which i plan to spring on you at some point soon. they really surprised me when i first saw them too. and yes, i've seen those two (responded to one) and have so delayed on everything else! 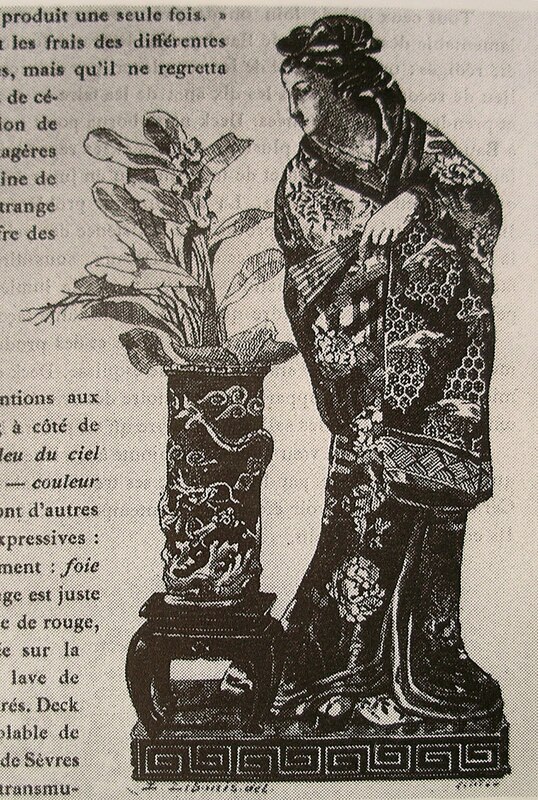 Your mention of A Grammar of Japanese Ornament especially interests me. Besides the lovely illustrations you linked to, can you tell me if the book includes much written discussion of the forms of ornamentation and what their meaning, symbolism or use was in Japan at that time? Or if not that, what is the nature of the narrative in that book, generally? 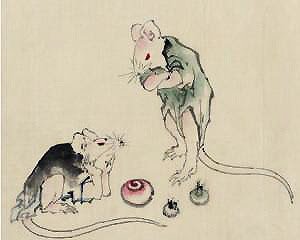 thanks for stopping by, deborah -- yeah-- aren't the mousies cute? sorry, i have no further info on the cutler book.